I’m always in search of simple, time-saving rubrics that make it easier for kids to understand how they’re being assessed. Today, I’ve invited middle school principal and former Language Arts teacher Dennis Kafalas to share some awesome strategies he’s developed for making your rubrics easier to use AND higher quality. Thank you, Dennis! Correcting student work with a rubric drives me crazy: the criteria is generally vague; most students only care whether or not the holistic score is a passing grade, and many get by without giving their best. For me, the worst feeling in the world is to pass back papers thinking and feeling something’s missing, that the best intention of the lesson missed its mark. Quality has to be non-negotiable. For example, all students are told that at least 3 score in all grading categories on a 5 point rubric is acceptable. Any criteria that scores below acceptable (3) is recorded as incomplete. Students aren’t given a grade for the entire project until that section is redone. Does that create a problem? Yes, because it means I have to spend more time with them on improving their work, which takes a while. I know there’s pressure to cover the curriculum and time is valuable, but I’ll take quality over quantity any time. Over time, though, they learn that doing it right is better than always redoing. And if they refuse? They earn a low D for the project with the option to redo at any time, even after the new marking period begins. Of course, parents are notified and are usually supportive of the opportunity to improve a grade. The easiest way to grade with this rubric to use this scale: all 3’s equal a 90 grade; 3’s and 4’s equal a 95, and all 5’s equal a 100. Using this scale makes it easy for them and me. There’s no trying to decide what combination of scores is passing or not. To challenge my motivated students, I’ve added this standard for all categories, “Exceeds grade level expectation.” On a rubric score of one to five, this is the highest score, and separates the very good from the great. All it takes, too, is for one student to ask how to earn it, and others will follow, making the classroom dynamic more productive and focused. The benefit of a process criteria is that students who might not be confident about the assignment are happy that their attempt to do their best will be rewarded. Those students who don’t give their best earn an incomplete and must redo those sections to which they didn’t fully apply themselves, which is only fair. To me, a process grade adds an element of real world expectation: you must attempt to do your best – always! Adding a process criteria was the best move I could’ve made. More students stay on task and ask questions about their work before completing it. In fact, I have to allow more class time for on-the-spot conferencing, which saves correcting; I’m able to teach in the moment and prevent errors. Overall, I’m more aware of students’ needs; the quality of the student work improves, and we get better at using rubrics as the year goes along. Using direct, non-teacher talk works better — and is actually hard to do — but worth it. Students who, in the past, never even bothered to read the rubric, now work closely with it. I’ve gotten into the habit of leaving high quality papers with their rubric scores in the class for students to review. In the past, it was hard to explain to students why they earned their grade and how to improve it. Using quality student work allows me to occasionally let students compare their work to the benchmark piece, and it makes it easier to talk about what needs to be improved. Working off benchmark papers makes my talk with students focused and to the point, another time saver! I’ve learned that rubrics are scoring guides, but they are not set in stone. The tweaks I’ve mentioned here have changed my grading dynamic. Initially, rubrics were just a way to score students’ papers or projects. Now, by expecting quality and effort, and by adding a challenge, my students and I spend a lot of time working, talking and conferencing with the rubric in mind. I’m convinced that tweaking a rubric to fit one’s teaching personality is a smart move. 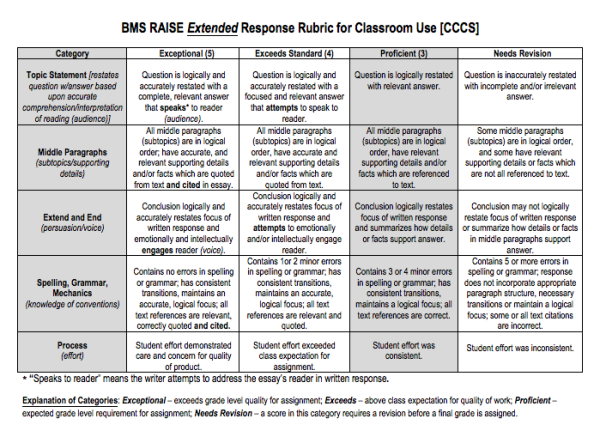 How do you use rubrics with students? Have you found any strategies to make them easier to use and more useful? Please share your experiences or questions for Dennis and I in the comments. I’ve never thought of using a process rubric before. Genius! I like the added motivation that could bring to a project. Thanks for sharing. I will have to check out that book, too. I never thought of it, either! I just uploaded an editable version from Dennis and that you download and modify–check it out! Hi, Angela: Could you update the link to my website (see below) that’s listed in the intro? Thank you!